If you live in Austin, Texas I have some good news. A new shop opens its doors for the first time this Saturday, September 15, and you'll want to check it out. 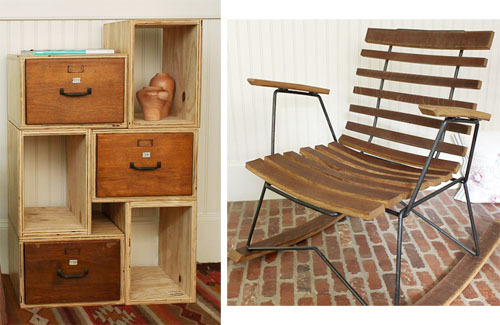 Mockingbird Domestics specializes in local, fine crafted furnishings and lovely home provisions. I particularly like the work of one of their local artists, Jack Wilson. As owners Jeff and Laura Daly shared, "His passion is taking the simple objects, like old drawers and assembling them in a new arrangement to give them a whole new life." Both Jeff and Laura look for items to include in their shop that excude a modern, classic style with a good story to tell. This Travis Heights Chest of Drawers may be my favorite piece from Jack. As stated on their site, Jack "hand selected the right pieces of selected reycled fence posts and gently sanded and sealed them to preserve the character." This Mod Cubby UT Library Drawer via Hatch Workshop in Austin is built to work either vertically or horizontally. Hand crafted with pine plywood and reclaimed solid wood drawers, it's a beautiful and fun piece that will endure. And then of course, there's the incredible Texas Wine Cask Rocker (once a wine barrel), from one of my favorite shops, Petrified Design. I love this Hand Truck Ottoman, particularly becuase it used to be a hand truck. As stated on their site, "This sturdy piece of farm equipment was once used to move cotton, now it is made to add comfort and utility to your home." Handcrafted by Ken Bizzell of Atlanta. 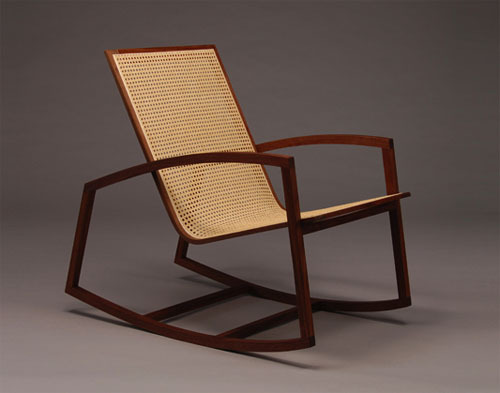 Laura's favorite piece in her new shop is this Linda Lou Rocker made of black walnut and rattan. As Laura shared with me last week, "The simple lines with caned backing is so well crafted and represents the epitome of what Mockingbird is all about." Jeff's personal favorite item for sale are the incredible bags via Bexar Goods. As Laura shares, "This product is inspired by the brown grocery bag and its function is a fresh alternative to the plastic bag and flowery totes." As much as I'm admiring their furniture, Mockingbird Domestics will carry a bevy of wonderful home decor items as well. From vintage and ceramics to rugs, textiles, art and lighting. So if you're in Austin this weekend, be sure to stop on by their shop at 2151 South Lamar. They will have artisan demos all day Saturday and sweets catered by Lick Ice Creams. Wish I could be there...Good luck Jeff and Laura!